April 2018 marks the 100th anniversary of the tragic and devastating Spanish influenza pandemic that killed more than 500,000 Americans in the space of a year from April 1918 through February 1919. Today's blog post is one of a set of DNCR WWI blog posts intended to commemorate the role of all North Carolinians in this pandemic. Every North Carolinian was touched by the illness, which killed more Americans than died in the U.S. military during WWI. Beginning in April 1918 at the height of the United States’ war mobilization on the home front for World War I, the Spanish influenza pandemic broke out in the country. The Spanish flu is reported by historians to have come to North Carolina through the shipping port of Wilmington, spreading from east to west across the state from there. The flu came in three waves in 1918-1919: April 1918 was a somewhat mild version of the Spanish flu; September-November saw the worst version of the Spanish flu hit all over the state; and January-February 1919 was the last of the flu’s cycle in the state. Many North Carolina soldiers from the state’s 30th Division, U.S. Army (which had been the North Carolina National Guard), began returning from Europe in the spring of 1919—between March and May 1919. They missed the worst of the flu in the U.S., but had suffered from it in Europe. Many North Carolina soldiers only heard about the terror of the Spanish flu on their friends and family through letters. Many people who wrote letters to military service individual overseas were killed by the flu, and service individuals would not hear from them or about their deaths for months after the fact. Archivists and historians in North Carolina often see original soldiers’ letters written home to people who had been killed by the flu, with the hope that they were faring well and would respond. The world North Carolina service individuals returned to in late 1918 through the summer of 1919 was totally changed, with friends and loved ones no longer living. In addition to dealing with what we now call “post-traumatic stress disorder,” returning to college, starting a family, or trying to find a job, returning military veterans would spend much of their first few weeks home visiting the graves of their loved ones killed in the Spanish flu pandemic. But one of the more overlooked aspects of the Spanish flu pandemic in North Carolina are the thousands of names of volunteer female nurses who risked their lives to care for the sick. These volunteers—most serving through local American Red Cross chapters—delivered food through the Red Cross Motor Corps, tended to the ill, transported sick individuals or visited at their homes, and performed a great many other heroic acts during this horrible period. In Wake County in 1919, the Raleigh American Red Cross chapter, which worked closely with the Wake County Red Cross, created a list of all of the women who served as volunteer nurses in Raleigh and the surrounding communities during the Spanish flu. 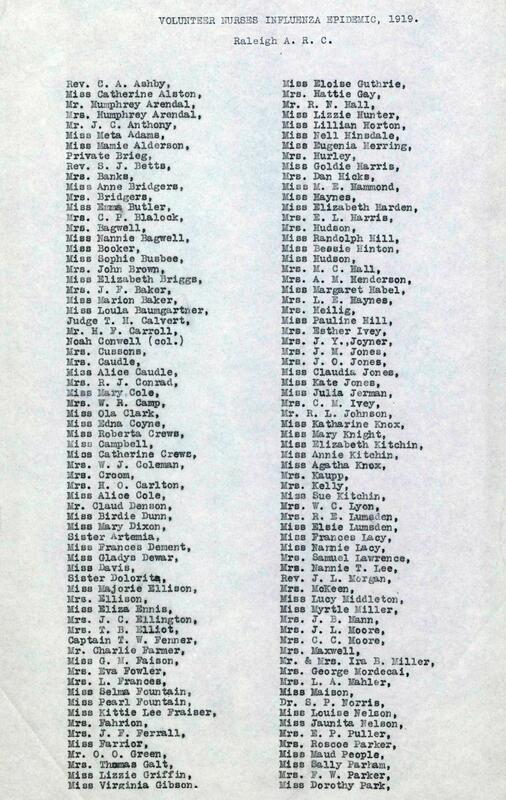 The list also includes black nurses (marked as “col.” for colored) who are recognized with their white counterparts. This one and a half page typed list is the only known list (apart from period newspaper articles) of the women in Raleigh, N.C., who nobly served their community during the pandemic. You can check out the original list, and see if one of your female relatives is documented as having served as a volunteer nurse, through this link in the online WWI collection in the North Carolina Digital Collections (NCDC), a joint effort of the State Library of North Carolina and the State Archives of North Carolina.